Surface Engineering and Applied Electrochemistry is a journal that publishes original and review articles on theory and applications of electroerosion and electrochemical methods for the treatment of materials; physical and chemical methods for the preparation of macro-, micro-, and nanomaterials and their properties; electrical processes in engineering, chemistry, and methods for the processing of biological products and food; and application electromagnetic fields in biological systems. 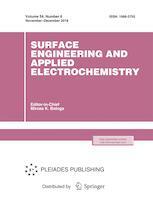 Surface Engineering and Applied Electrochemistry is a peer reviewed journal. We use a single blind or double blind peer review formats. Our team of reviewers includes 105 reviewers, both internal and external (93%), from 13 countries. The average period from submission to first decision in 2017 was 5 days, and that from first decision to acceptance was 30 days. The rejection rate for submitted manuscripts in 2017 was 8%. The final decision on the acceptance of an article for publication is made by Peer Reviewers.